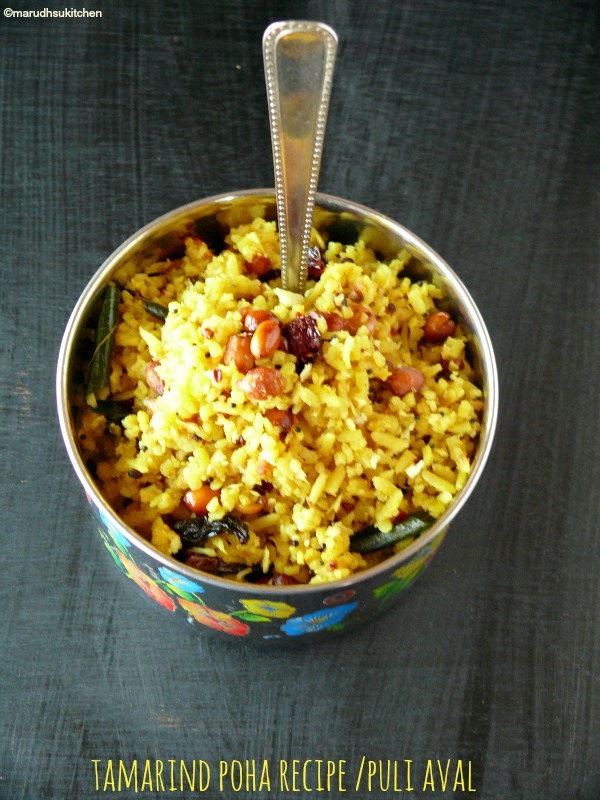 An ingredient that can be easily handled and relatively easy to cook obviously becomes a favorite for many and one such item that falls in the list is “aval/poha”.Softened poha/flatted rice serves as a super light food on your tummy.Both variations like thick and thin varieties are available in the market.Alternatively,even red aval/ragi poha is available even this can be used to make this puli aval recipe.For making upma only thick variety will be apt. The preparation for this tamarind poha recipe /puli aval differs from place to place that they directly cook the poha in tamarind water itself.Even shredded coconut is not at all used.In my method I have soaked poha in tamarind water and don’t worry all the water will be absorbed by itself.When soaking the water-tamarind mixture level should be slightly higher than poha(almost immersed not too much). If you add too much of it then aval will become mushy.I have used ordinary oil you can use even gingelly oil.Usually its(tamarind poha recipe /puli aval) considered as a breakfast food but I consider it as an excellent snack food. 1.Soak tamarind take extract,filter mix it with a cup of water and keep ready(or as needed to soak poha). 2.Wash poha nicely and take it a vessel add tamarind water. 3.Add salt and turmeric powder mix well and rest it for minimum 20 minutes(check for salt and adjust). 4.All water will be absorbed. 5.Keep kadai with oil when it heats up add mustard to splutter. 6.Add both dals,peanuts,curry leaves,red chilles and asafoetida. 7.When everything is roasted add soaked poha,powdered jaggery and mix well. 8.Spread then and there so that it does not stick together. 9.Lastly add shredded coconut and switch off. Note:If you add too much of water when soaking aval it may become mushy so do it accordingly. Soak tamarind take extract,filter mix it with a cup of water and keep ready(or as needed to soakpoha). Wash poha nicely and take it a vessel add tamarind water. Add salt and turmeric powder mix well and rest it for minimum 20 minutes(check for salt and adjust). All water will be absorbed. Keep kadai with oil when it heats up add mustard to splutter. Add both dals,peanuts,curry leaves,red chilles and asafoetida. When everything is roasted add soaked poha,powdered jaggery and mix well. Spread then and there so that it does not stick together. Lastly add shredded coconut and switch off. If you don't like skip adding coconut add roasted sesame seeds powder instead. When adding tamarind water always check for sourness and balance accordingly. If you add too much of water when soaking aval it may become mushy so do it accordingly. It can be served with a simple pappad or curd. Never had tamarind poha, but this looks so delish, Vani. 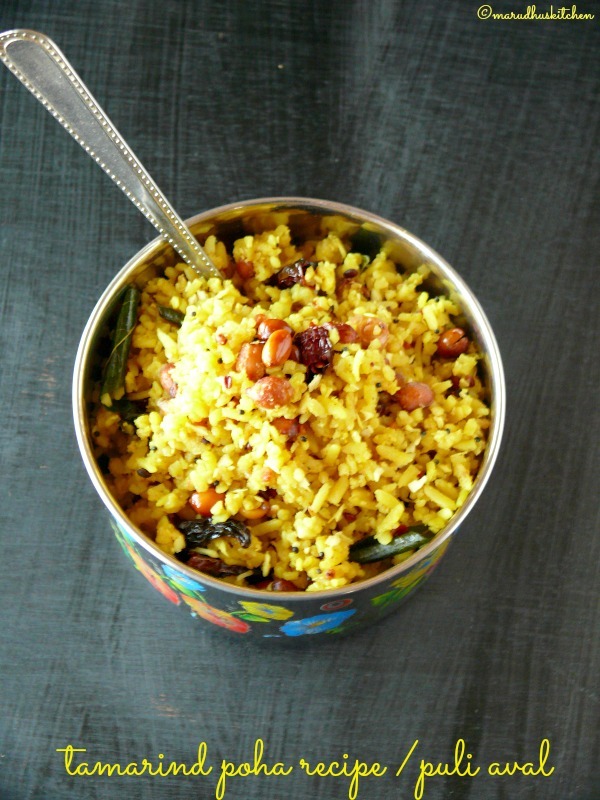 Would try it next time when I will make poha! As a quick option I sometimes make this but my kids are not a fan…but I love it..nice share vani! !